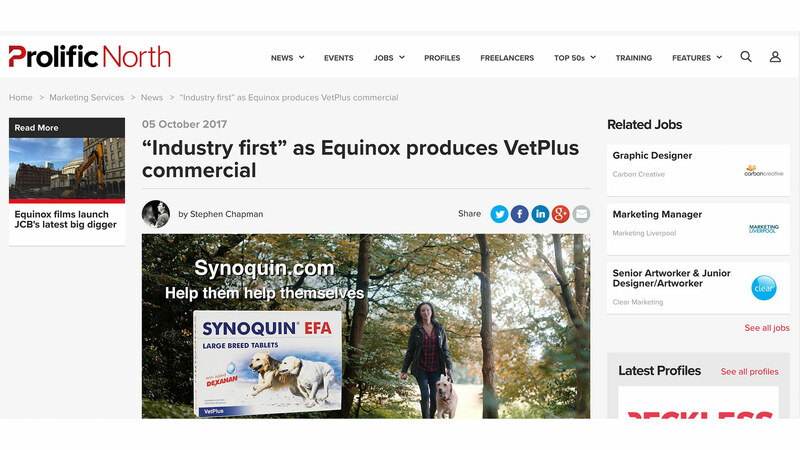 We are proud to release the industry-first TV Commercial production work for VetPlus, and their flagship product, Synoquin. The objective of the TV Commercial is to promote the Synoquin joint supplement, whilst also driving footfall into independent veterinary practices. Filmed on location in Knutsford, Cheshire, the campaign focuses on promoting the benefits of the Synoquin product through the eyes of the dog and its owner. The concept required ‘Charlie’, played by Hugo the dog, to portray differing behavioural styles to successfully capture contrasting scenarios, to highlight the product benefits. Careful thought, consideration and planning was paramount to ensure that Hugo’s time on set was used wisely and effectively. The £1 million TV campaign has been produced by Equinox, with media planning by MediaCom, Manchester. The exclusive deal with ITV, will see the advert shown exclusively throughout October and November on ITV. An estimated 20.7 million people are expected to see the advert over an eight-week period. Phillipa Chadwick, head of marketing at VetPlus, said: “We believe not only is this the first time a nutraceutical company has invested in TV to this level, but it is certainly the first time a manufacturer has directly promoted the concept of visiting your local vet to a national TV audience. The Federation of Independent Veterinary Practices (FIVP) said: “The FIVP is delighted to see companies supporting the independent sector and promoting the excellent service provided by independent practices.